Find peace of mind with fast service and spotless installations. With over 20 years of Vinyl window manufacturing experience. You can trust Clearview Vinyl Windows to bring you friendly, expert advice, competitive pricing, and high quality installations. It's quick, painless, and free! Take the first step to beautiful new windows today. Have your windows installed professionally by our Pros. With superior quality and master craftsmanship, we guaranteed you will love how clean and fast our window installations are! Looking to install windows yourself? No problem! With a huge variety of styles at costs any homeowner can afford, you’re sure to find a great fit for your home. Apply for a free price catalog today! An average home may lose 30% of its heat energy through its windows. Beat the odds with Energy Star. Learn how Energy-efficient windows can save you money each and every month. Decrease your loss of energy today! We offer a variety of vinyl window sizes and styles. Whether you’re a homeowner looking to replace your windows, or a contractor installing for a new build, we have the right windows for you. Vinyl Windows Can Save You Money! Want A Quiet, Energy Efficient Home? With Clearview Vinyl's Energy Star Certified Windows, you can save on your heating bills and help out the environment at the same time! Results are already adding up. Americans, with the help of Energy Star, saved enough energy in 2010 alone to avoid greenhouse gas emissions equivalent to those from 33 million cars — all while saving nearly $18 billion on their utility bills. Clima Guard LamiGlass blocks sound transfer and 88.9% of UV rays to reduce noise and harmful rays. Or, combine it with ClimaGuard Low-E for energy cost efficiency. Our tempered glass if 5x stronger than regular glass. And, our SatinDeco and Patterned options are perfect for creating private, elegant spaces. Learn more on our Guardian Glass page. 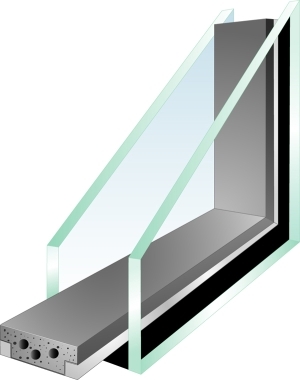 Eliminate Window Condensation with Edgetech.